Separatists have called for a strike in Kashmir Valley today after seven people were killed in explosion after an encounter in Kulgam district yesterday. Over 40 were injured in the blast and the clashes that followed. Three terrorists were killed in the encounter. An unexploded shell was lying at the site and went off after the encounter was over and security forces had left the spot. 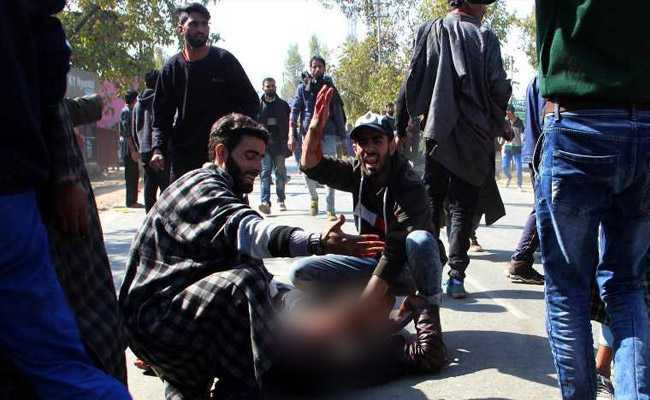 The encounter was followed by clashes between villagers and security forces which took place in which several people were injured after they rushed in to engage the security forces. The police are now trying to understand the nature of explosives used. Initial investigations suggest that it could be a rocket propelled grenade or a motor shell used during the operation. Security forces recovered a rifle and two pistols from the house but didn't clear bits and pieces of the shell that exploded. A senior police officer admitted that they withdrew from encounter site without sanitising the area and defusing unexploded shells. "We had asked people not go there but hundreds rushed there and it was when the shell went off," the officer said. "Yes, it is our responsibility to clear and sanitise encounter site before we withdraw from there. We are looking into all aspects,'' the officer said. The deaths have once again raised questions over the use of excessive firepower during encounters. During encounters, security forces use mortar shells, rockets and incendiary material to destroy target houses where terrorists are hiding. Advisor to Jammu and Kashmir Governor K Vijay Kumar and the state's top police officer Dilbag Singh expressed regret over the loss of civilian lives. "To strongly condemn and protest the mayhem unleashed in Kulgam, in which five civilians and three armed youth were killed and scores of others injured, the Joint Resistance Leadership calls for a complete shutdown tomorrow. We will hold a protest sit-in at Lal Chowk on Tuesday," All Parties Hurriyat Conference leader Mirwaiz Umar Farooq tweeted.